Hitting Off a Tee is the best method, doesn’t matter whether training for baseball or softball, for learning how to hit for control and handling any pitch, regardless of location or height. 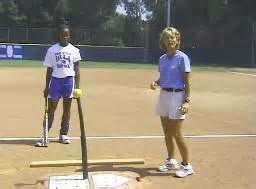 Hitting is an art form which requires learning skills designed to address all kinds of different hitting situations and goals, but for the most part, a hitter’s goal when entering the batter’s box is to hit the ball solidly and hard. The best way to accomplish this is to hit the ball in front of the plate, after the hips have exploded, turning your shoulders and your arms are fully extended creating maximum power. (1.) A hitting tee, the more flexible as far as raising or lowering the nest, the better, but not mandatory. (2.) A rubber throw down home plate, or a home plate made of any other material, such as plywood or carpet will work. (3.) Baseballs or Softballs, depending on the sport you’re involved in. (4.) Protective Netting if hitting inside or practicing by yourself. (5.) Place the throw down home plate where you need it. (6.) Turn the hitting tee around backwards so the flat edge of the attached home plate butts against the flat edge of the throw down plate. This positioning will have the throw down plate represent home plate, and the location of the ball on the tee will represent hitting the ball in front of the plate. I might mention, in my opinion, this positioning set-up backwards to represent hitting the ball deep in box doesn’t work every well, unless extremely modified, because the location of the ball is Too Deep and results in hitting nothing but foul balls. Test Swing: Batting tees are set up different depending on the manufacturer, the flexibility and amount of stanchions to vary ball placement, so it’s best to initially test your foot placement and swing to insure you can reach the ball correctly from your stride, as the first few times using this set-up may seem a little awkward or strange. Now that you’re comfortable with your batting stance location, it’s time to focus on the ball and learn to hit it with authority, which initially begins with placing the ball belt high at the center of the plate. Here’s a tip on narrowing your focus, which works exceptionally well with a softball due to it’s larger size, but the red color of the baseball seams also offers a great target. 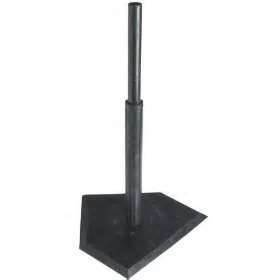 Place the ball on the stand with the open end part of the seams facing the catcher on a horizontal plane. 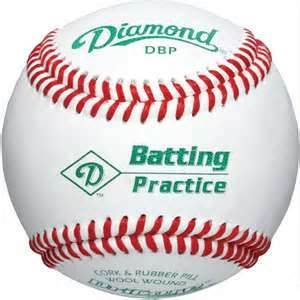 Concentrate on hitting the ball hard by focusing on striking the ball with the bat directly in between the seams, hit the ball on the upper seam to produce ground balls and hit the lower seam to produce fly balls. Because you’re hitting into a net the results of whether you struck the ball where you intended will be quickly evident most of the time. Like I said earlier, in my opinion, the tee offers the best hitting aid available for developing, not only the basic swing mechanics, but the mechanics require to hit every type of pitch. (1.) Keeping the ball at waist height, move the location of the tee to present the ball on the inside portion of the plate, placing the ball with the open seams horizontal, do not adjust your batting stance location. Hit this inside pitch with the same focus and intent of between, below and above the seams, making note that your hips are quickly opening bringing your bat quickly through the hitting zone. (2.) Repeat the same procedure by moving the tee to where the ball is presented as an outside pitch. (3.) Perform hitting the inside, outside and down the middle pitch at different heights. As you can see the number of variations are endless, by combining different heights and locations, but if you feel really good about being able to hit most variations of pitches which are strikes, try hitting balls not in the strike zone. Let’s face it, we don’t always swing at pitches which are strikes, and the older and more skilled we become as players, pitchers will rarely throw you a strike, especially right down the middle, as they are taught to nibble at the plate making you swing at their pitch. 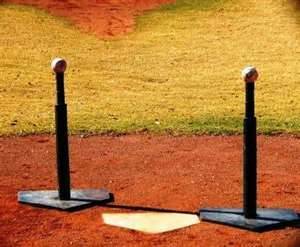 You can get a jump on the competition by learning how to hit balls off the plate an inch or two, hard. This skill can only be developed through practice, no different than any other skill set, but you can become quite successful at hitting “Their” pitch, which will force the pitcher to constantly expand the plate making a 2 walk per game average quite normal for you.